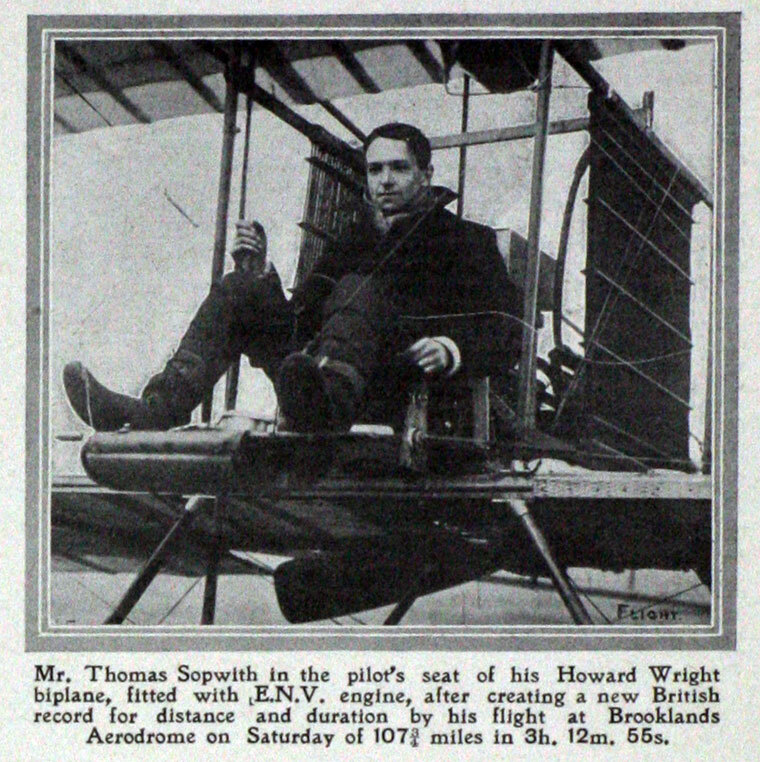 Sir Thomas Octave Murdoch Sopwith, CBE, Hon FRAeS (1888–1989) was an English aviation pioneer as well as a celebrated yachtsman. 1888 January 18th. Born in Kensington, London, the eighth child and only son of Thomas Sopwith (1838-1898), a civil engineer and managing director of the Spanish Lead Mines Company of Linares in southern Spain, and grandson of Thomas Sopwith (1803-1879). He was educated at Cottesmore School in Hove and at Seafield Park engineering college in Lee-on-Solent. His childhood was deeply affected by an incident on a boating expedition during the family's annual summer holiday on the Isle of Lismore, off Oban in Scotland. A gun, lying across the ten-year-old Sopwith's knee, went off and killed his father. This haunted Sopwith for the rest of his life. In his youth, he was an expert ice skater and played in goal during Princes Ice Hockey Club's 1908 match with C. P. P. Paris. 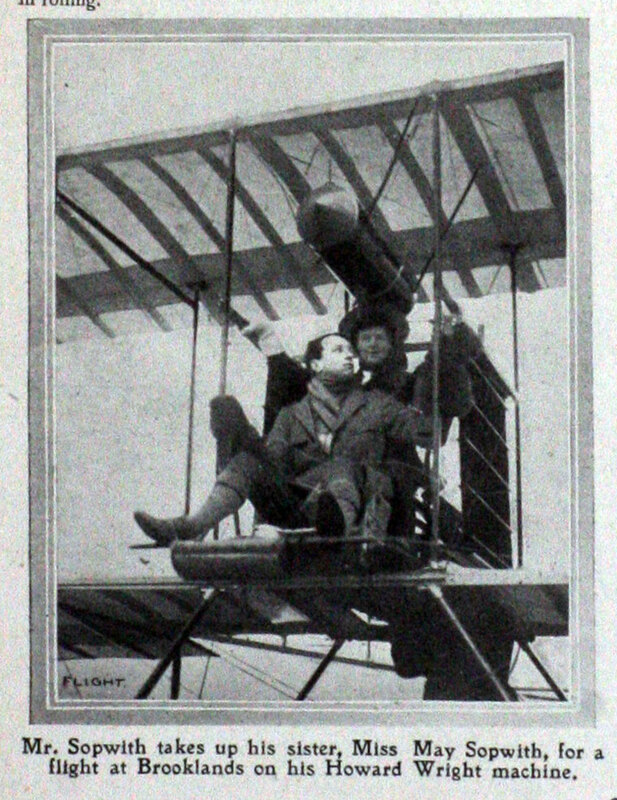 He became interested in flying after seeing John Moisant flying the first cross-Channel passenger flight. 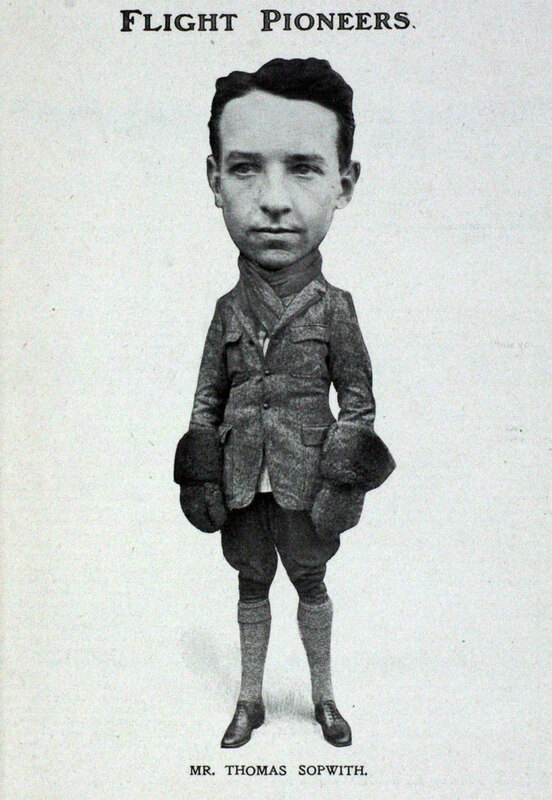 His first flight was with Gustav Blondeau in a Farman aeroplane at Brooklands. 1910 October 22nd. 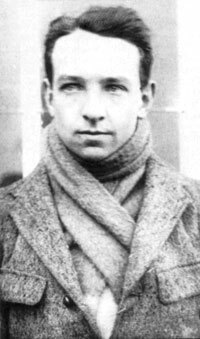 He taught himself to fly on a British Avis Monoplane and took to the air on his own for the first time, but crashed after travelling about 300 yards (275 metres). 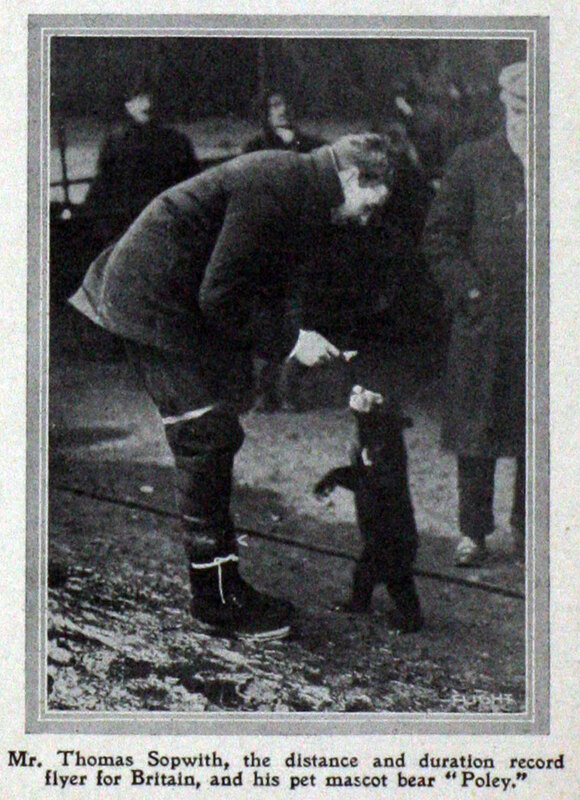 He soon improved and on November 22 was awarded Royal Aero Club Aviation Certificate No. 31. 1910 December 18th. Sopwith won a £4,000 prize for the longest flight from England to the Continent in a British built aeroplane. He flew 169 miles (272 km) in 3 hours 40 minutes. He used the winnings to set up the Sopwith School of Flying at Brooklands. c.1912 With Samuel Edgar Saunders he designed and built what is stated to have been the first flying boat in Europe. 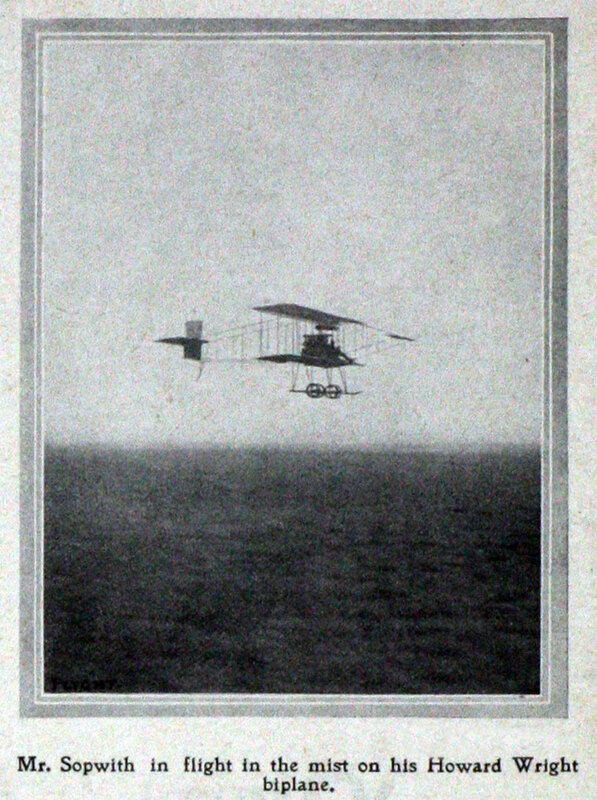 This won the Mortimer-Singer prize for seven consecutive landings on land and sea, piloted by Henry Hawker. 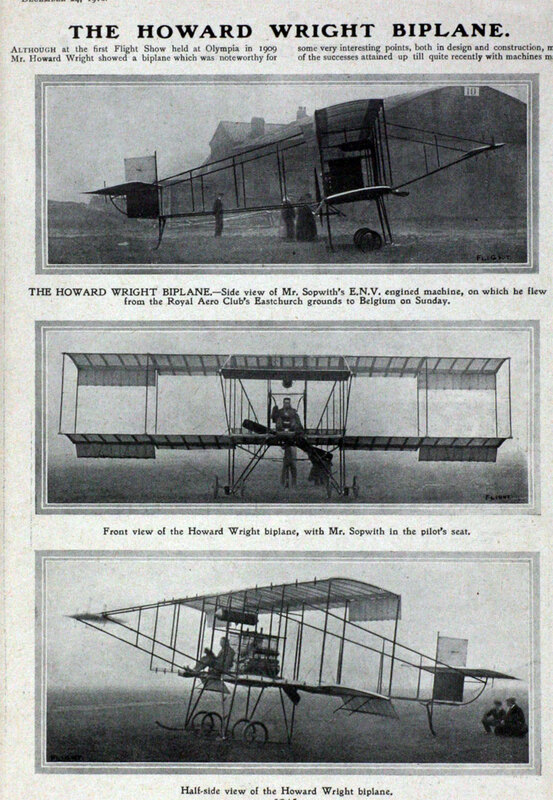 In June 1912 Sopwith with Fred Sigrist and others set up The Sopwith Aviation Company. WWI The company produced key British World War I aircraft, most famously the Sopwith Camel. 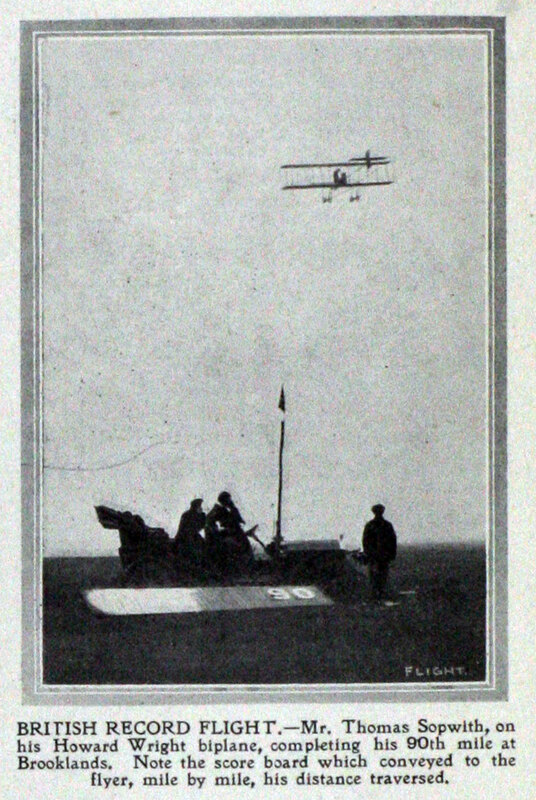 Sopwith was awarded the CBE in 1918. Post War: Sopwith built only fifteen aircraft between the end of the war and September 1920, while endeavouring to maintain the employment of as many of its workers as possible by building motor car bodies, motorcycles, and even aluminium saucepans. September 1920: Sopwith, faced with demand for anti-profiteering taxes, put the company into liquidation while he was still able to pay creditors in full. Two months later he launched the H. G. Hawker Engineering Co Ltd, with himself as chairman, Fred Sigrist as chief engineer, and Harry Hawker as designer/test pilot. 1928 the first flight took place at Brooklands of the Hawker Hart designed by Sydney Camm. 1935 Sopwith was Chairman of Hawker Siddeley until his retirement. In 1934 and 1937, Sopwith led challenges for the America's Cup in his yachts Endeavour and Endeavour II. Both yachts featured advanced technology. In addition to owning the yachts and organising the challenges, Sopwith was also helmsman during the races. After the nationalization of what was by then Hawker Siddeley, he continued to work as a consultant as late as 1980. His 100th birthday was marked by a flypast of military aircraft over his home. 1989 January 27th. He died in Hampshire aged 101. His authorized biography is Pure Luck by Alan Bramson, with a foreword by the Prince of Wales (ISBN 1-85260-263-5). This page was last edited on 6 December 2018, at 09:39.